We love greens and eat several varieties each day either raw in salads and smoothies or lightly sautéed or steamed. Greens are an amazing food that provide a healthful abundance of macro- and micronutrients. Their variety is staggering and we celebrate them all. That said, it’s easy to fall into a rut and shop on autopilot at times, grabbing the tried and true romaine, spinach and kale rather than the watercress, stinging nettles, amaranth or mustard greens. Mix it up as often as you can and you’ll be blown away at the bounty of nature’s variety and the amazing gift our senses get to experience. This soup has very few ingredients, yet is an incredibly flavorful meal. 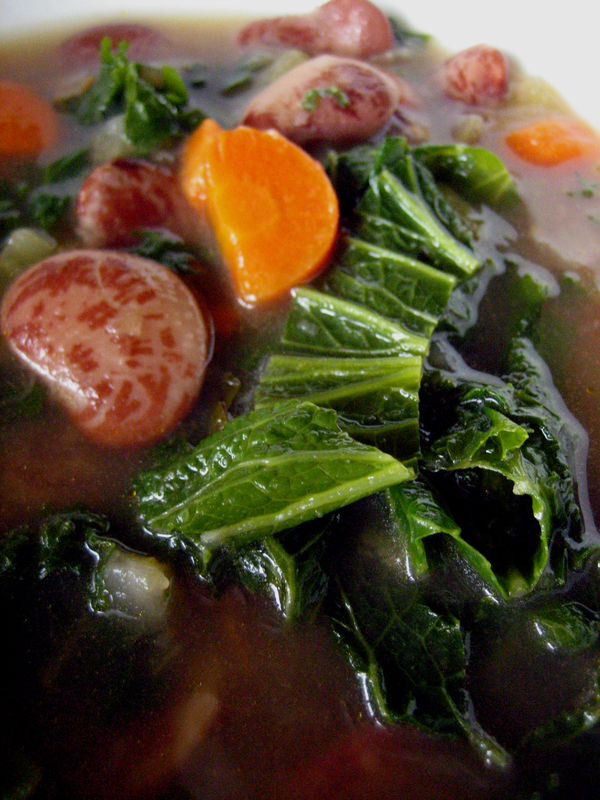 The Lima beans and mustard greens combine to surprising perfection. Place a soup pot over medium high heat and add the olive oil. Sauté the onions and celery until softened. Add the garlic and carrots and sauté for a few minutes, until you can smell the garlic cooking. Add the lima beans and stock. Bring to a low simmer and cook for about an hour or until the Lima beans have softened. Add the mustard greens and cook for an additional 10-15 minutes. Season to taste with salt and pepper. Sounds like a lovely clean and healthy soup, although I will probably have to resort to the standby silverbeet or spinach as I can’t recall seeing mustard greens around these parts. Any green would do nicely here. I tend to prefer the spicier ones like dandelion and mustard greens when I can find them.